Elon Musk biography review: How did a sci-fi nut with a hero complex becoming a world-changing industrialist? What Fuels the Rocket Man? A theory of Elon Musk. 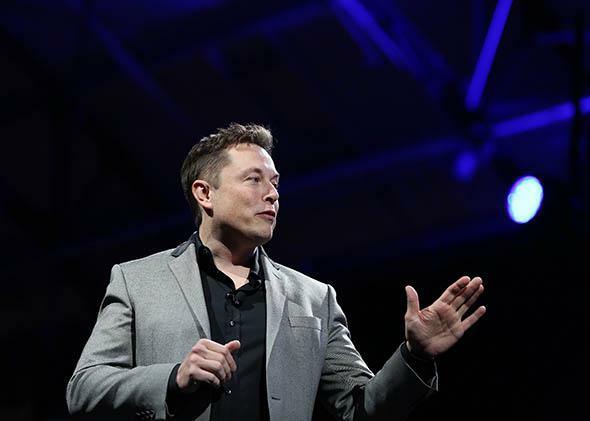 Tesla Motors CEO Elon Musk unveils utility-scale home batteries at the Tesla Design Studio in Hawthorne, California, on April 30, 2015. When people compare Elon Musk to Steve Jobs, they mean it as a compliment. Musk is not yet a household name, whereas Jobs is the most iconic entrepreneur of his generation. To Musk, though, it just might be an insult. Sure, the Tesla and SpaceX chief has politely demurred at the comparison, calling Jobs “way cooler than I am.” But after reading Elon Musk, Ashlee Vance’s new biography of him, I can see how Musk might have meant that as a backhanded compliment. Being cool has never been Musk’s aim. From the start, his earnest goal in life has been—and I’m not exaggerating here—to develop the technologies he deemed most crucial to the future of humanity. (Surprise: MP3 players and smartphones didn’t make the list.) As preposterous as that sounds, he might actually be doing it. At 43, Musk has helmed at least three companies that could fairly be said to have upended their respective industries. PayPal did it to payments, Tesla to cars, and SpaceX to space travel. SolarCity, whose board he chairs, is among a handful of startups threatening to do the same to electric utilities. Forget Jobs: Vance places Musk in the pantheon of history’s great industrialists, alongside Edison, Ford, and Rockefeller. Some critics have chided the veteran Businessweek columnist for his apparent hyperbole. Those critics are, of course, just the sort of people whose conventional wisdom Musk has made a career out of defying. The electric car was dead; against all odds, Musk’s Tesla revived it—and built one of the great vehicles of all time in the process. The space race was over; Musk’s SpaceX reignited it. The residential solar power industry was moribund; thanks in part to SolarCity, it’s booming. For all his achievements, however, Musk is not an uncomplicated figure—nor, by any account, an easy man to work for. Vance’s lively book yields all manner of fascinating insights about Musk’s companies, his vision, and his personal life. But what I hoped to glean from it was this: What could drive one man to tackle so many seemingly impossible problems, let alone solve them all? And: Is there a fatal flaw that might yet prove his undoing? A close reading of Musk’s life suggests the answer to both questions may be related. He tends to assume—not without reason—that he is smarter and more capable than just about everyone around him. So whatever others are doing—whether it’s finance, cars, rockets, solar panels, or his own company’s public relations—he naturally assumes he could do it better. From a precocious but harsh childhood in South Africa, meanwhile, he absorbed the lesson that the status quo is largely a product of layer upon layer of laziness and incompetence. That the reigning consensus holds a given task to be impossible presents no obstacle to Musk: It might just mean no one as ingenious and determined as he has seriously tackled it yet. This otherworldly optimism, it seems, has been largely borne out by his success—a statement to which the skeptic might add a couple of modifiers: just barely and so far. Growing up in Pretoria, South Africa, Musk’s social skills were as stunted as his intellect was precocious. A “classic know-it-all,” he read encyclopedias cover to cover and missed no opportunity to correct others’ mistakes. He appeared to genuinely believe they’d be grateful to be informed of their ignorance. A demanding and emotionally abusive father, his parents’ divorce, and relentless bullying in school—he was once shoved down a flight of stairs and had to be hospitalized—only drove Musk deeper into the recesses of his own prodigious brain. He learned to program computers and immersed himself in science fiction, fantasizing about futuristic technologies and cosmic battles between good and evil. He also developed a high tolerance for hardship and an extreme work ethic. Still, hounded at school and at home alike, who wouldn’t begin to dream of colonizing other planets? Musk bolted South Africa at the first opportunity and attended college in Canada and then the United States, where he finally encountered a smattering of geeks and dreamers who appreciated rather than resented his brilliance. Still, he appears to have carried with him his low regard for received wisdom. Early in the first dot-com boom, he dropped out of a Stanford Ph.D. program to start his own Internet concern, a local business directory service called Zip2, which sold to Compaq for $300 million in 1999. He started X.com, which merged with another startup run by Max Levchin and Peter Thiel to become PayPal. It was there that Musk’s difficult management style first undermined him, and he was eventually forced out as CEO, although he walked away with more money than anyone else when PayPal went public and was subsequently acquired by eBay in 2002. What do you do for an encore after selling two successful Internet startups and pocketing more than $200 million? If you’re a standard-issue Silicon Valley wunderkind, you buy yourself some nice things and settle into a cushy career as a venture capitalist. If, on the other hand, you’re a sci-fi nut with a hero complex, the answer is pretty obvious, right? You stop fiddling with petty Internet sites and set about saving the human race. As Wait But Why’s Tim Urban recounts in his own delightful recent profile, early on Musk identified five technologies he thought had the greatest potential to alter the course of history: “the internet; sustainable energy; space exploration, in particular the permanent extension of life beyond Earth; artificial intelligence; and reprogramming the human genetic code.” Disillusioned with the first, and ruling out the last two as potentially more evil than good, Musk set his sights on sustainable energy and space exploration. And that, of course, is how he came to choose SpaceX, Tesla, and SolarCity as his next three major ventures. That quote encapsulates Musk’s boundless ambition, as well as the Ciceronian structure of his sentences, which tend to chase so many ideas at once that they lose sight of their own predicates. Musk, too, is chasing a lot of ideas at once these days. He’s CEO of both Bay Area-based Tesla and Southern California-based SpaceX, each of which would seem to demand more vision and vigor than most mortals could muster. He’s also chairman of SolarCity, whose founding idea Musk inspired while driving with his cousin in an RV to Burning Man. In his spare time, he tosses off half-formed ideas to revolutionize mass transit. Maybe not. There is evidence in Vance’s book that Musk possesses at least some degree of sympathy for human frailty. For instance, a SpaceX engineer once vented to a colleague that he was nearing a breaking point after ruining both of his pairs of eyeglasses in an all-consuming work sprint that left him no time to see an optometrist. Musk overheard him, and within hours his assistant approached the employee with an appointment card for Lasik surgery, and Musk picked up the tab. But even Musk’s admirers admit that his expectations can be a bit high. He has a habit of setting goals and deadlines that appear impossible to everyone but him, then driving himself and his team to meet them anyway, whatever it takes. If this seems a risky way to run a business or three, it has indeed led to near-ruin on a few vertiginous occasions. The closest call came in 2008. After three unsuccessful rocket launches, SpaceX was down to what was likely its last chance to prove the whole venture hadn’t been the grievous miscalculation the doubters had always assumed it was. Tesla, after five years in business, had been beset by delays and had yet to put its first car on the market. Gleeful bloggers started a “Tesla death watch” as the company veered toward bankruptcy. In the end, SpaceX’s fourth launch succeeded. Musk began desperately borrowing money from SpaceX to keep Tesla afloat and bluffed Tesla’s investors into extending a last-ditch funding round. Within two days in late December 2008, SpaceX won a $1.6 billion NASA contract and Tesla closed the crucial funding deal just in time to make payroll. Conventional wisdom holds that it’s healthy to accept your limitations and temper your hopes. Musk, of course, isn’t interested in being healthy, any more than he’s interested in conventional wisdom. (“The pressure of feeling the need to fix the world takes its toll on Musk’s body,” Vance notes.) Someday that disregard may yet lead Musk to fail spectacularly, crashing back to Earth like one of his ill-fated rockets. Until then, we might as well enjoy his wild ride. Musk famously served as inspiration for Robert Downey Jr.’s portrayal of Tony Stark in the movie Iron Man. Unlike Stark, Musk doesn’t drink much. And despite an air of glamor surrounding his personal life, which has included two failed marriages to the actress Talulah Riley, he isn’t particularly suave. Still, there is a sense in which Musk’s life really does resemble that of a comic book superhero. He operates on a different plane of endeavor than the masses, and as a result he constantly runs the risk of being thought crazy. And then, periodically, he pulls off a feat that makes you wonder: What if he’s the sane one, and it’s the rest of us who were crazy for ever doubting him?